Take 1 tablet 3 times daily, preferably with food. The daily demand for magnesium fluctuates around 350 mg. If decided to use supplements containing magnesium, we should take them 2–3 times a day in divided doses. Magnesium preparations should be taken with water, because juices and tea reduce its absorption, and coffee increases the excretion. Moreover, to increase magnesium absorption, you sould take it with vitamin B6. 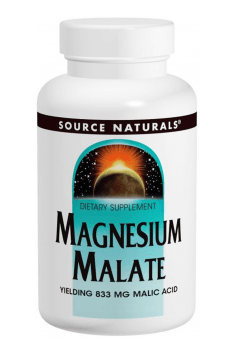 Magnesium malate contains a molecule of malic acid, binded with two molecules of magnesium. Such form is characterised by high bioavailability. A supplementation lasting from six weeks to six months allows for a restoration of the proper magnesium levels. The product is recommended for active people, involved in sports, working intensively physically and/or intellectually, exposed to stress. Herbal supplement that bolster immune system and revitalize entire body. The formula supports the body’s regeneration and boosts vitality.